Buy One Get One Free. Yes we are in-between semesters but that doesn't mean you can't train with us!! 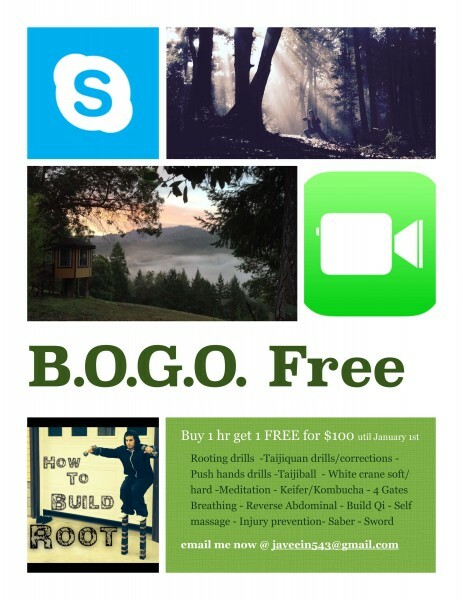 Right now until January 1st 2015 you get an hour free when you purchase 1 skype session with me! Yay! We can also facetime! If you want to get some corrections on your taiiquan or saber form, get yourself a holiday qigong program, do some taijiball or kettle bell drills; I'm here to work. You? Email me and let's do some meditation or qigong! "The actions of the sword are considered a reflection of one's mind." Ancient swords-men of Japan discovered that supplementing their study with the art of calligraphy improved their over-all skill. If you have never tried a brush stroke you might not grasp the relevance of subtlety. Tuishou Massage combines qigong massage and pushing hands in just this way. When you take this course you will grasp the subtly of listening jing in harmony with the hands and the mind. By training these programs together we build new connections in our brain which deepens our understanding of the theory. Further, this understanding is reinforced and manifested in real-time. Even if one is versed in Taijiquan theory, expresses jing effectively, and balances substantial with insubstantial movement; one may still benefit from this program by learning a new way of teaching the concepts which build the fabric for internal training. Just as ancient sword masters supplemented their training with the art of calligraphy, the push hand players of the future will be supplementing their training with qigong massage. You can be a part of this movement by booking a workshop with Javier. Often when training pushing hands, it's difficult for people to see the benefit of a relaxed-mind and soft-hand approach. In addition, to effectively apply Taijiquan jing theory one must keep one's own center regulated. Only when this is achieved can one begin to place one's hands on another, whether it's for massage or push hands. This is where the importance of meditation enters, so one can see how a regular meditation practice can be crucial. By training massage with pushing hands technique, one is forced to use a soft and tactful approach that does not disrupt the experience for the patient. This induces a state of relaxed awareness which begins to build a foundation for safe, effective martial training. A pushing hands match can be chaotic and the mind tends to go into flight or fight mode. This makes the mind chaotic and raises the energy out of the persons root. As the root becomes compromised the body seizes, and fills with tension, which is the apposite of soft and relaxed. With the mind not centered, the energy not in control, and the body locked up; the practitioner is unable to respond effectively. By training pushing drills with massage mentality, we bypass the mind and body's initial response to fight and tense-up. In this way we take a back door-approach, in the mind, to circumvent the tendency to fight and push back. We must always look to apply our training into our lives. As we take this approach to learning, we facilitate an environment of awareness and observation. We train ourselves to relax and to respond gracefully to all situations that life presents. When we train this way we provide a service to ourselves and to the the world. So there you have it. I am going to start teaching within this framework. Whether it's taiji ball, hard/soft white crane, even meditation; it gives context to all of the things that we train on a daily basis. That's it for now. Skype me! Let's train.